NOTE: All items being offered on this website have appropriate provenance and are legal to buy and own under the United States statute covering cultural patrimony Code 2600, Chapter 14. Every purchase comes with a written certificate of authenticity (COA) and are fully guaranteed to be as described. Provenance and accurate, detailed condition information is included with each listing. To Purchase or Ask a Question: Contact me via email at: joey@ancientartifax.com or call 828-322-2942. Payment options are check, money-order or PayPal. Credit Cards can be processed through PayPal. Discount may apply on the purchase of multiple items. Shipping costs not included in purchase price. Tracking info will be provided. Shipping options are USPS Priority Mail, UPS Ground and FedEx. International sales (outside of the United States) require payment via PayPal. All international shipping costs, insurance and import fees are the responsibility of the buyer. 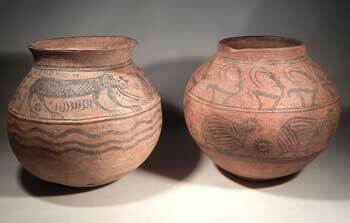 Two large terracotta vessels from the Harappan civilization, Indus Valley. Both are spherical shaped and are nicely painted with traditional motifs. One is decorated with a pair of lions surrounded by plants and geometric designs. The other shows a row of Oryx (antelopes) and a row of pheasants. Both in fair condition and are assembled from original pieces with break lines restored and light paint enhancements. Moderate deposits along with minor chips and dings. Both appear intact and are substantial in size. Originally from an old German collection. More recently, Ex. F. Hamid collection of California. Approx. 6" across x 6" tall. A small Magna Graecia pottery kylix (Apulia or Campania) circa 4th Century BC. 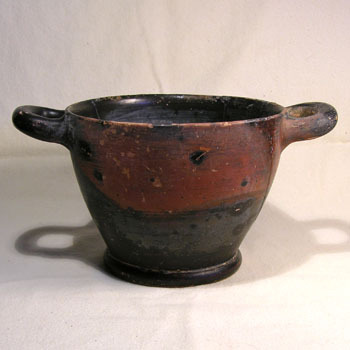 This blackware wine cup has a low footed base and twin horizontal handles as is typical. In fair condition. Assembled from 3 large pieces with break lines restored. Some interior paint loss and calcified deposits present. Ex. J. Behnkin estate of Atlanta. Approx. 6.5" across x 1.75" tall. 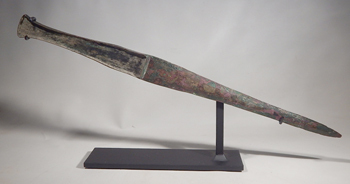 A nice Luristan bronze age sword from ancient Persia. Heavily cast with a long, slender double-edged blade that tapers gently to the tip. The handle has recesses on both sides that once held decorative inlays of wood, bone or ivory; long lost to time. In near excellent condition. Intact with no breaks, cracks or repairs. A fine example. Custom metal display stand is included. Ex. Cookston collection of Atlanta, GA. Ex. Los Angeles private collection. Approx. 16.5" long. Just under 8" tall on the stand. 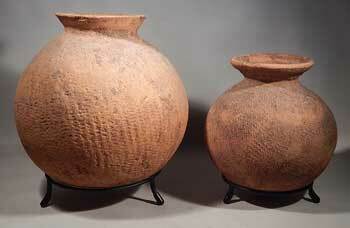 Two very rare and early, pre-Dynastic Egyptian terracotta vessels dating to the Neolithic - Naqada II Period. Typical of the type found at Malkata and around the Fayoum. Rounded spherical bodies narrowing at the neck then widening to a flared rim. The surface is textured, what Petrie would have categorized as Type M, or 'rough-faced' pottery. Moderate deposits and some surface encrustation as would be expected. In very good condition. Vessel 1 (left) - An unusually large example and has four small rim chips missing, otherwise intact. Vessel 2 (right) - Intact with a few stabilized cracks at the bottom. Both are completely original with no restoration. Ex. V. Yarborough-Richards, retired anthropology professor at Wake Forest University in Winston Salem, NC. Acquired by Professor Richards from a colleague at Wake Forest who personally dug these and other similar pieces in Egypt in the early 1960s while on an archeological salvage expedition during the construction of the Aswan Dam. The larger vessel is approx. 8" tall x 7" across. The smaller vessel is approx 6" x 5". Displayed on metal tripod ring bases which are included. $1250 for both. Not for sale individually. 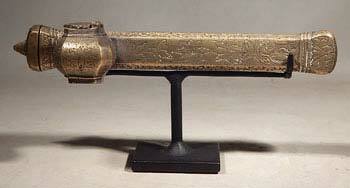 An exceedingly rare inscribed Luristan dagger from ancient Persia. Cast in bronze with a tapered blade and handle that ends with a flared pommel. The inscription is an eastern alphabetic script, a derivative of a form of Aramaic showing Gandharan influence. The inscription on the front is a sword (or dagger) symbol followed by several 'letters' that likely translate to a single name. The reverse has a similar sword symbol and a shorter word or date. Although inscribed weapons from this culture and era are very rare, some have been translated and indicate they are inscribed with the names of kings that ruled during the time that the weapons were created. It is thought that these inscribed daggers were given to only very high ranking military personnel; possibly gifts from the king for exceptional valor or bravery in battle. Another theory is that inscribed daggers were owned only by soldiers that were tasked with protecting the king himself or guarding the royal family. A fine and seldom seen example with a rich verdigris patina. In excellent condition. Completely intact with no repairs or restoration. The inscriptions are clear and could be translated by an expert in ancient Gandharan or similar linguist. Custom metal display stand is included. Ex. Pax Romana Gallery of London. Ex. Kent collection of the U.K.
Approx. 7.25" long. 9.25' tall on the stand. 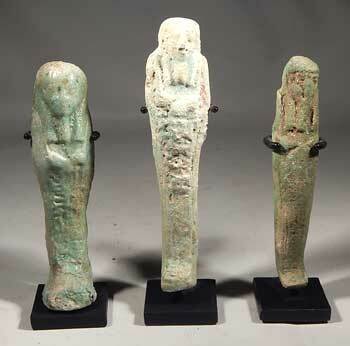 Three small faience ushabti on custom metal stands, included. Ushabti #1 (left) - Small Egyptian ushabti dating to the 3rd Intermediate Period. 1075 BC - 664 BC. Blue-green faience surface with light deposits. Nice intact condition. Approx. 4.25" tall on the stand. Ex. J. Behnkin estate of Atlanta. Ushabti #2 (center) - Faience ushabti dating to the Late Period. 64 BC - 323 BC. In fair to good condition. It has a single restored break below the knees and a chipped nose and overall surface wear. Approx. 5" tall on the stand. Ex. Vancouver, B.C. Canada private collection. 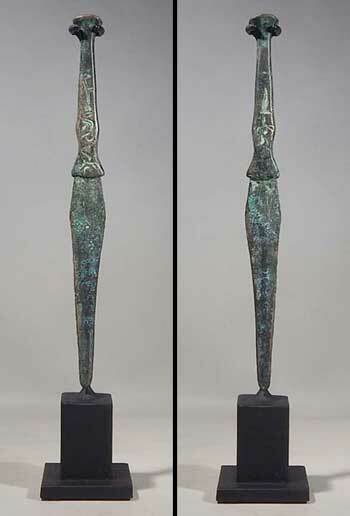 Ushabti #3 (right) - Small Egyptian ushabti dating to the 3rd Intermediate Period. 1075 BC - 664 BC. Somewhat crudely formed, but is intact. Approx. 4.25" tall on the stand. Ex. J. Behnkin estate of Atlanta. 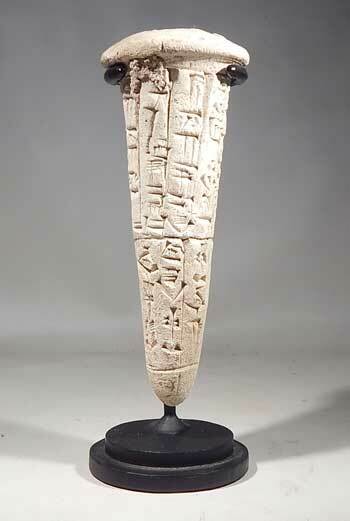 An ancient Sumerian foundation cone dating to the Second Dynasty of Lagash, Reign of Gudea, 2141 BC to 2122 BC. As is typical, this cone (or nail) shaped clay 'tablet' is incised with cuneiform writing around its body. The inscription is deep, clear and readable. Clay tablets like this are also referred to as 'dedication pegs' or 'foundation pegs'; they were inscribed, baked, and placed into walls of ancient temples to mark ownership either by a god or a ruler. These dedications sometimes include stories or boasts about the rulers they describe. Cones and tablets like this are among the world's earliest forms of written history. In good condition. There is a restored break across the center (that didn't affect the inscription) and is otherwise intact and original. Light surface deposits and earthen encrustation present. A fine example and larger than most. It displays nicely on the custom metal stand, included. Authenticated by Professor Renee Kovacs. Originally translated by CoinCraft in London, England. The cone reads: "For Ningirsu the mighty warrior of Enlil, Gudea, governor of Lagash produced everything appropriate and built his Eninnu (temple), the shining Indugud-bird, and restored it." Ex. J. Behnkin estate of Atlanta, GA.
Approx. 6" tall x 2.25" across the top. Approx. 7" tall on the stand. 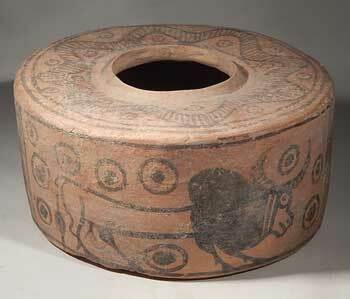 A lovely pyxis vessel from the Indus Valley, Harappan civilization. A squat, cylindrical vessel that sits on a flat base. It has straight sides with a flat top (shoulder) and narrow central spout with a short rim. The exterior is nicely painted in black against a buff pottery ground. Both sides depict a humped Zebu bull between panels of linear, angular and checkerboard motifs. The top shows undulating serpentine and circular designs. In fair condition. The top is assembled from approximately 10 original pieces with break lines restored and light paint enhancements. Moderate deposits with minor chips and dings, mostly on the underside. Originally from an old German collection. More recently, Ex. F. Hamid collection of California. 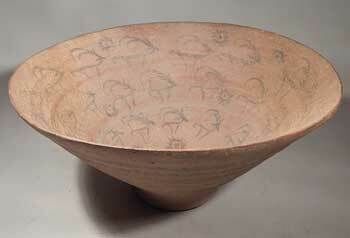 A large Harappan bowl from the northern Indus Valley. The base is small with the sides flaring widely. An elegant and rarely seen form. Rows of Oryx (antelopes) and sun-burst designs decorate the interior. The interior painting is an uncommon feature. In fair condition. Assembled from 8 to 10 original pieces with break lines restored and minor paint touch ups. Light deposits and paint fading overall. Originally from an old German collection. More recently, Ex. F. Hamid collection of California. An exceedingly rare Bactrian cosmetics palette from ancient Persia. 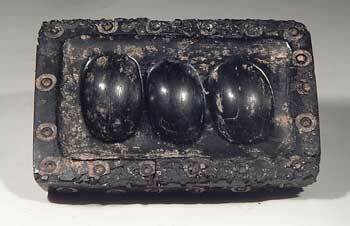 Beautifully carved from a light-weight black stone; most likely anthracite. Rectangular form with a recessed center containing three deep depressions which held various cosmetics. The top border and all four sides are decorated with concentric circles, typical of Bactrain stone carvings. In fair to good condition. Deposits, some pitting and flaking present on the sides and bottom, but is intact with no repairs or restoration. Ex. A. Weinberger of NYC, acquired from an old New York collection. Approx. 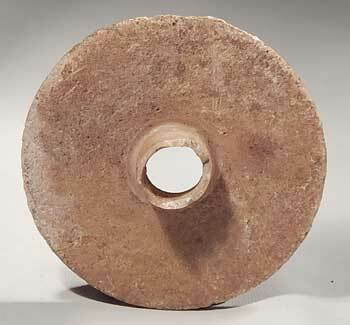 3" x 2" x 1"
A rare and very large ancient Egyptian alabaster (stone) spindle whorl. It features a finely carved flat disk with a short cylindrical shaft protruding from a central hole that would have held the wooden spindle. A very thin and delicate example. In fair to good condition. Generally intact and original with some light surface erosion and moderate deposits present. Chips missing from the central shaft that appear to be ancient damage. No repairs or restoration. Shows nice translucency. Ex. 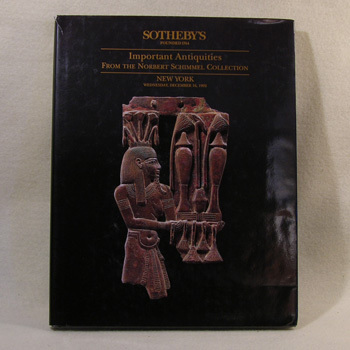 A. Weinberger of NYC, acquired from an old New York collection. Just over 2.25" in diameter. 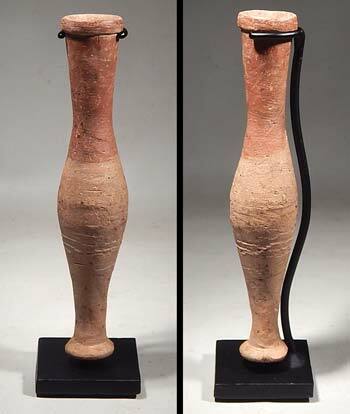 Lamp 1 (left) - A Jewish 'menorah lamp' from the Holyland dating to the 4th to 6th Century AD. In poor to fair condition. Cracks at the wick hole and manufacturing flaws on the bottom. Somewhat crudely made and doesn't sit level, but is completely original with no restoration or repairs. 4.25" long. 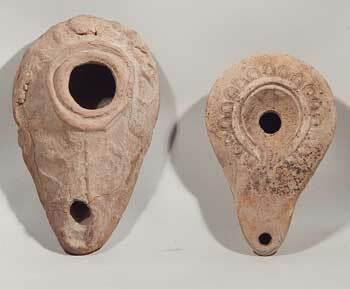 Lamp 2 (right) - A Roman-Egyptian oil lamp dating to the 1st to 2nd Century AD. Impressed decoration around the fill hole and deposits on the surface. Intact, with no repairs or restoration. 3.5" long. $225 each or $400 for both. 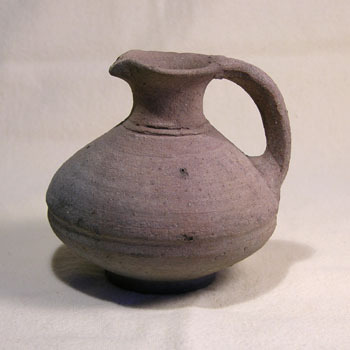 An early Parthian pottery pitcher (pouring vessel) from ancient Persia. Thickly potted with a footed base and rounded body that tapers to a corseted spout and loop handle. Covered in a yellowish-green alkali glaze with darker areas on the upper shoulder. Heavy deposits, mineralization and encrustation on the exterior surface. A few surface imperfections appear to be original to its manufacturing and are common for this period. In fair condition. The spout rim and handle are partially restored, otherwise intact. Ex. M. Dailey collection of Charlotte, NC. Approx. 6.5" tall x 3" across. 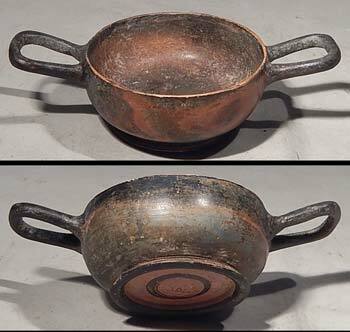 Two ancient Roman pottery bowls from the Holy Land dating to the 1st Century AD. Made of orange-red terracotta, typical of the area and period. Both are an elegant form, thin-walled and well made. Each is decorated with incised horizontal lines and impressed dots. Both have some minor erosion, light deposits and earthen encrustation. 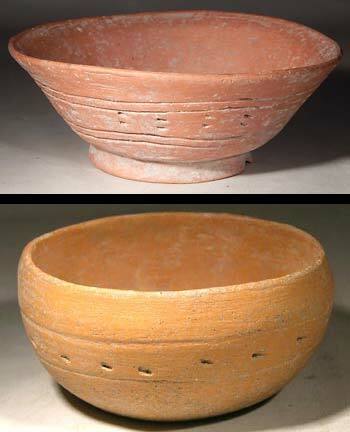 Bowl 1 (top) - In near excellent condition. Two small chips in the base, else intact. Approx. 4.75" x 1.75"
$125 each or $200 for both. A large Attic kylix from ancient Greece. It sits on a low footed base and curves gracefully upward to a slightly flared rim. At the shoulder there are two handles on opposing sides. An elegant, classic form. Typical orangeware construction with glossy black painted designs. Wide horizontal bands of black on the interior and exterior. Between the handles are vertical and horizontal palmettes. Under each handle is an ivy leaf. In fair condition. Assembled from a dozen pieces with breaklines restored and a few small losses replaced. Despite the restoration, it displays nicely and is a sizable example of this type. Museum deaccession. Ex. M. Dailey collection of Charlotte, NC. Acquired upon deaccession from the Greenville Museum of Art, Greenville, SC. Approx. 11.25" across the handles x 4" tall. An antique scribe's pen box and inkwell. These portable brass containers were used to hold quills and ink during desert expeditions. The pen box and inkwell have hinged lids and are decorated with engraved floral designs. In near excellent condition. A nice, older example. Custom metal display stand included. Approx. 7.25" long. Approx. 3.25" tall on the stand. 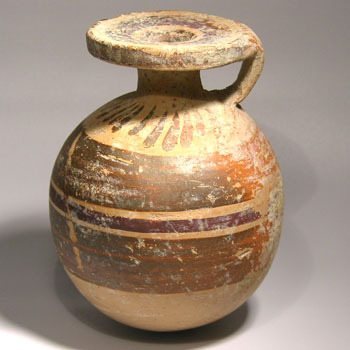 A fine Hellenistic spindle vase (bottle) from the Holy Land region. Buff terracotta with red slip at the top, a lovely form with a tall tapered neck, rounded body and small ring-footed base. Condition is fair to good. A break at the neck has been restored. One small shard at the spout rim has also been restored, otherwise intact. Light deposits on the surface as would be expected. An attractive example that displays nicely on the custom metal stand which is included as shown. Ex. Art for Eternity Gallery, New York City. 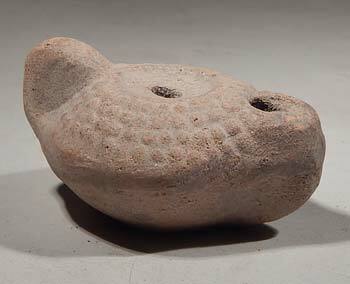 A small Roman mold-made terracotta oil lamp from the Holy Land, dating to the time of Herod the Great and Jesus. It has a lug-type handle and is decorated with 4 concentric rows of raised nodes. There's a wick hole and a center hole for filling with oil. A fine and prefectly preserved example with ample surface deposits present inside and out. 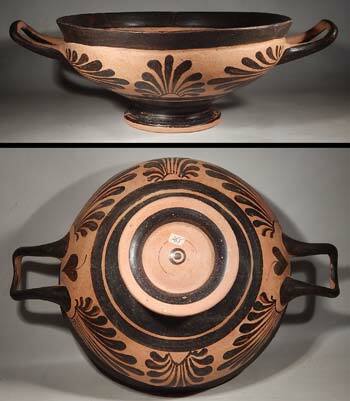 A lovely Apulian lekanis (two-part lidded vessel with handles). The bowl sits on a pedestal base and has opposing loop handles, all in black as is typical. The lid has a large knob type handle on top with painted geometric designs. The lid is nicely painted. On two sides are stylized palmettes, scrolls and fans surrounding opposing panels depicting a rabbit and a dog. This type, sometimes referred to as the 'hound and hare' motif, is more rare than the commonly seen 'ladies of fashion' design. In fair condition. The base and the lid have been assembled from around a dozen (12) original pieces with break lines restored. Ample deposits on both the base and lid. Despite restoration, it appears intact and displays beautifully. Provenance: Ex. European private collection. Ex. Abramson collection of Georgia. 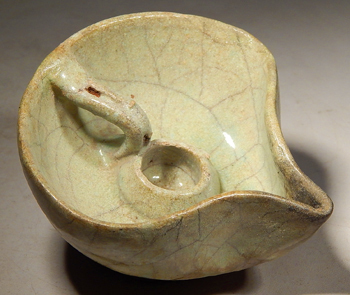 A low-profile pottery Skyphos with footed base and horizontal loop handles. The surface shows areas of black, orange and a rare blue-green color. The bluish haze was caused by adding hydrogen to the kiln during firing. This metallic blue color was an attempt to create a 'metal-ware' surface, which over time the Greek potters were able to achieve with varying degrees of success. In fair to good condition. Two rim shards have been reattached, a small rim loss has been replaced and one handle has been partially restored. Overall an attractive and well made example that appears intact. Provenance: Originally collected by an Orthodox priest on the Isle of Rhodes in the 1950s. Later obtained and owned by the founder of "The World Museum of Man" in Altamonte Springs, Florida. 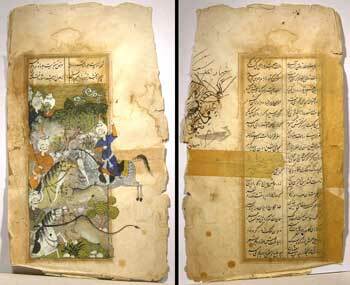 A Persian illuminated manuscript page. Exact age is unknown, but is most likely 19th Century, possibly earlier. Nicely painted on the front showing men on horseback in conflict with large cats. In the background three women are observing the battle from behind rocks and trees. The reverse has a partial drawing and two vertical rows of script. In poor condition with tattered edges and staining, but the painted image is clear and the colors are moderately vibrant. Old repairs on the back have tears secured with tape. Being sold as-is and unframed. 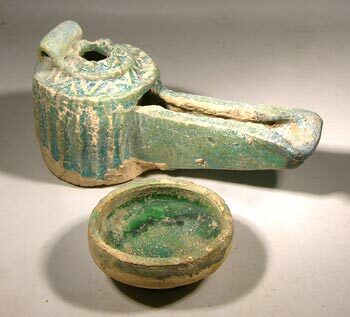 An unusual Islamic, medieval-period, oil lamp from ancient Persia. Footed base with a handle inside the bowl which may have been used for suspension. The surface is a light greenish-yellow glaze with craquelure throughout. In good condition with several rim chips restored otherwise intact. Some staining at the wick area and underneath with encrusted deposits around the base. A nice example and a rare type. 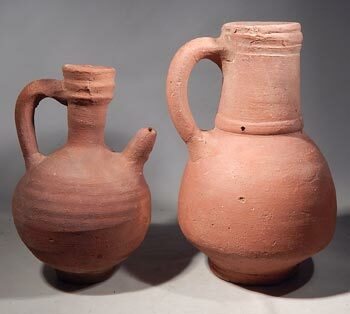 Two Persian redware terracotta vessels dating to the Medieval Period. 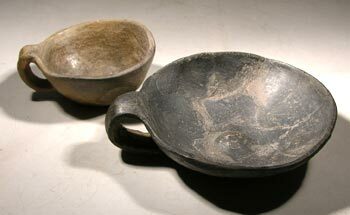 This type of high-fired table wares, made for everyday use, are similar in style to earlier Roman types. 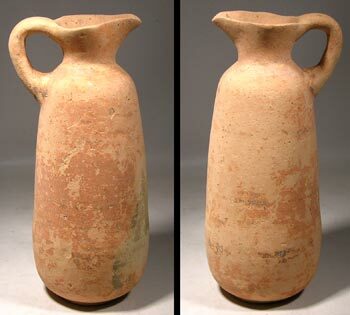 Both are typical utilitarian wares and are like those found in and around the Odeion. Vessel #1 (left). A pitcher with loop handle and pouring spout. In very good condition. A small hole has been restored, otherwise intact. Approx. 7.5" tall. Vessel #2 (Right). A pitcher with loop handle and tapered neck. In good condition. A 3"x3" section of the upper rim has been restored, otherwise intact. Approx. 8.5" tall. Vessel #1 has been SOLD. $200 for the remaining vessel. 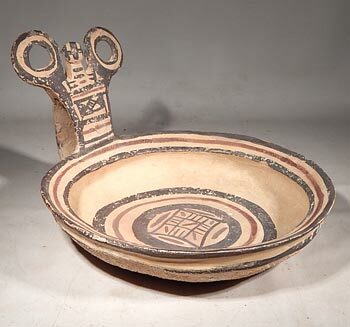 A lovely Greek Duanian Kaythos (wine ladle - dipper) from Southern Italy. A round, shallow bowl with tall strap handle all painted with red and dark brown geometric decoration. The rim shows thin bands with wider bands in the bottom, encircling a segmented square in the center. The handle, painted in fineline linear and diamond shapes, is topped with double-ring 'spectacles'. The underside is painted with concentric bands, chevrons and a central square. Condition is very good. The handle has been reattached in two places with breaks restored along with two areas of rim restoration and some light paint touch ups. There are minor paint losses and scattered deposits overall. Areas of the bottom are heavily encrusted with thick deposits. A rare type and desirable form. 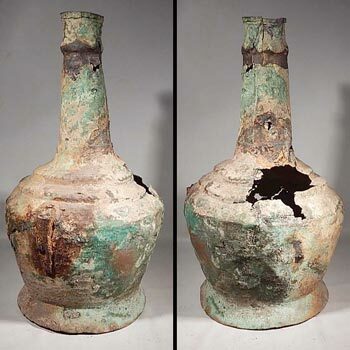 A large Kashan copper ewer from Central Persia dating to the Seljuk Period. Footed base and rounded body with stepped shoulder, topped by a tall tapering spout. Made from hammered copper and shows the remains of a bronze handle which attached on the side and again near the top of the spout. The missing handle would have likely been a tall arched type, typical of the period. May have also once had a hinged lid. Condition is poor to fair. Heavily encrusted over the green (verdigris) surface with rust and staining where the handle was once attached. One large hole and other smaller losses along with cracks and dents. Some areas are thin and fragile, but overall is stable and displayable. Definitely shows its age, but is a rare survivor of the period. Approx. 12.5" tall x 7" across. 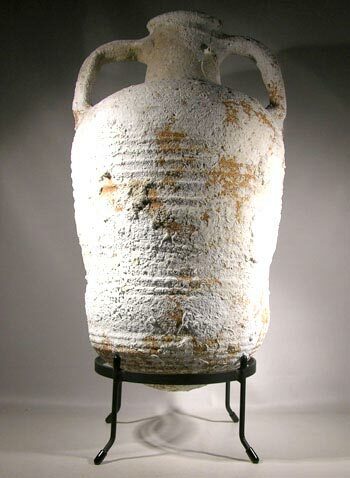 A large Middle-Roman era sea-encrusted pottery wine amphora (storage vessel) from the Holy Land area of the Eastern Mediterranean. Rounded bottom and ribbed sides with a straight neck and flared spout. Two thick handles attached from the shoulder to the neck. 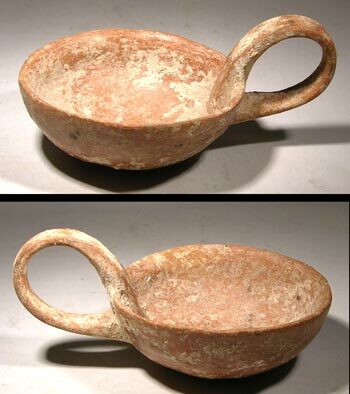 This form was a common type during Roman-Byzantine Period and used widely throughout the Roman Empire in the transport, distribution and storage of wine. Redware terracotta construction. Heavy sea encrustations inside and out. Almost completely covered with remains of numerous sea creatures; shells, sponges, worm tubes, barnacles, etc. In excellent and intact condition with no cracks, breaks, repairs or restoration of any kind. A choice example that displays beautifully on a custom metal stand that is included as shown. This piece was originally collected in the 1970s at the site of an ancient shipwreck off the coast of Turkey. Ex. New Mexico private collection. Approx. 18" tall x 10" across. Approx. 21"" tall on the display stand. 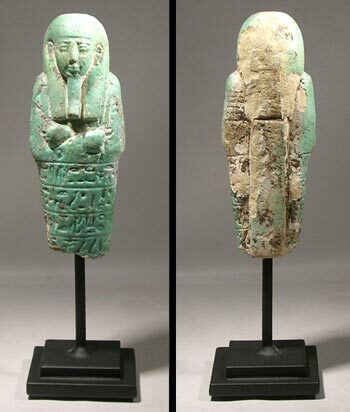 An Egyptian faience ushabti dating to the Late Period. A mummiform type, wearing tripartite headdress and false beard, arms folded across chest. The hands hold a pick and hoe with a bag over the left shoulder. There are four registers of hieroglyphic text down the front. Lovely blue-green (turquoise) faience surface. In good condition. The feet and lower legs are missing. A restored break across the head and other minor repairs. Some areas of faience loss, mainly on the back. Moderate earthen deposits in the crevices. Displays nicely on a custom metal display stand that is included as shown. Ex Joel L. Malter collection. 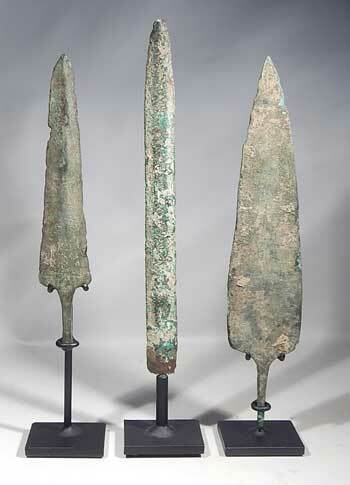 Three fine Luristan bronze age weapon points from ancient Persia. All are heavily encrusted and have a nice patina. They display well on custom metal stands which are included as shown. Point #1 (left) is a spear point with tang intact. Minor blade edge losses otherwise in very good condition. Approx. 7.5". Approx. 10.25" tall on the stand. Point #3 (right) is a spear point with tang intact. In very good condition. Minor repair to the tip, otherwise choice. Approx. 9.75". Approx. 10.25" tall on the stand. Point #2 is SOLD. Remaining points are $250 each or $450 for both. 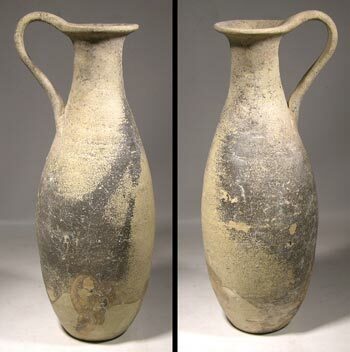 A large Roman pottery wine amphora (pitcher) dating to the 2nd Century B.C. Orignally found in the Mediterranean Sea off the coast of Turkey and brought to the United States by a U.S. Serviceman in 1970. Heavily encrusted inside and out with numerous barnacles, small shells, worm tunnels and the remains of sea sponges. In very good condition. One 2 inch by 4 inch rim shard has been restored. Also, a few sections of damaged tunnels have been repaired. 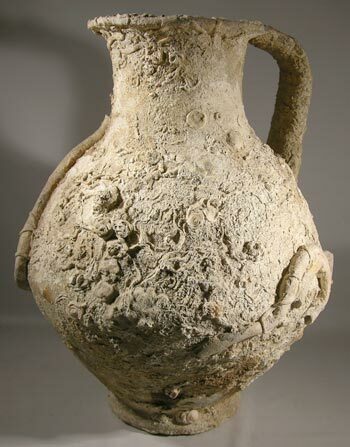 Overall an exceptional example of ancient sea salvage pottery. Ex. S. Blom collection of Arizona. Ex. G. Alderman collection of Georga. Priced individually or $500 for both pieces. Two small Central European Lusatian pottery cups dating to late Bronze Age to the early Iron Age. Both have strap handles and lightly burnished surfaces. The smaller is brownware and is intact with two surface scrapes on the underside. The larger is blackware, assembled from approx. 10 original pieces with unrestored breaks. Rare items! Museum deaccessions. A very large and attractive Indus Valley pottery vessel from the Nal Culture of Baluchistan, dating to the early Bronze Age. An unusual form with flat bottom and top. The sides are slightly corseted. 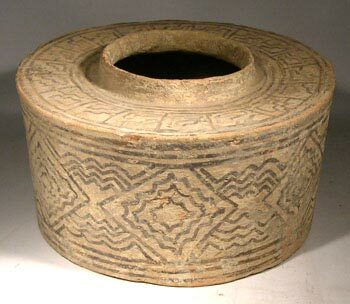 Buff terracotta; nicely decorated with complex painted geometric designs. Condition is quite good. One shard reglued and the break restored. The interior break line has not been restored. Minor losses have been replaced and the paint touched up. Areas of light earthen deposits remain. An exceptional example and much larger than most. Ex. G. Alderman collection. Ex. K. Godsoe collection. 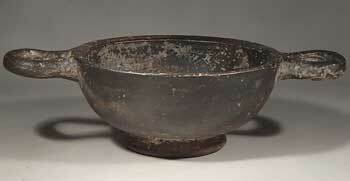 Large Greek grayware Oinochoe. Elegant tapered form with a tall body and strap handle. Light gray clay with areas of black slip remaining. Unlike the ornate examples made for the wealthy, this is a utilitarian vessel used by average, working-class Greek citizens. Overall condition is very good. The handle and areas of the spout are restored, otherwise intact. A few scrapes and dings consistent with age. This piece was originally collected by an Orthodox priest on the Isle of Rhodes in the 1950s. This piece and several others in the priest's collection were later obtained by the founder of "The World Museum of Man" in Altamonte Springs, Florida. Greek terracotta Oinochoe. Nicely formed with a tall body, strap handle and trefoil spout. Light orange clay with areas of red slip remaining along with traces of black linear decoration. Unlike the ornate examples made for the wealthy, this is a utilitarian vessel used by average, working-class Greek citizens. Overall condition is very good. Areas of the spout are restored. Also, the strap handle was broken and break restored, otherwise intact. Redware Greek Kyathos from the Isle of Rhodes. Well formed bowl with a large strap handle. Heavily encrusted surface consistent with age. This is a "common man's" plainware Kyathos. Unlike the ornately painted blackware examples made for the wealthy elite, this is a utilitarian vessel used by average, working-class Greek citizens. Condition is generally good. Two small rim chips have been restored. The strap handle has been paritally restored, otherwise intact. This piece was originally collected by an Orthodox priest on the Isle of Rhodes in the 1950s. This piece and several others in the collection were later obtained by the founder of "The World Museum of Man" in Altamonte Springs, Florida. 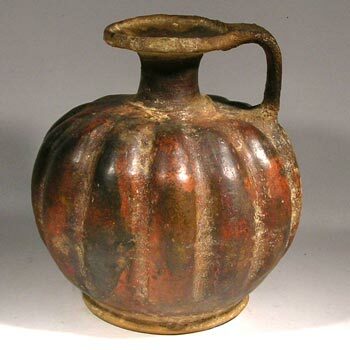 Large Etruscan pottery vessel in a (seldom seen) deep red color. An elegant form with ribbed sides, low footed base, strap handle and a thin neck topped by a wide spout. A rare form; the ribbed (pumpkin shape) is very uncommon. In good condition. Assembled from original pieces with restored breaks, but appears intact and near choice. Shows nice deposits of mineral and earthen encrustation, somewhat heavy in some areas. Displays beautifully. Please refer to the "Restoration Services" area of this site to see before & after photos of the repairs on this piece. Large Greek Corinthian aryballos. Typical round-bodied with thick flat rim and strap handle. Nicely decorated with concentric bands of red and orange around the middle. Flower pedal designs at the shoulder and broad stripes around the top of the spout. 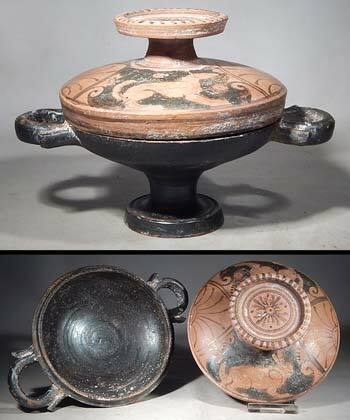 This type of vessel was used in ancient times to hold precious scented oils and perfumes. Globular aryballos were used by Greek men, the elongated versions (called alabastrons) were used by women. Overall condition is very good. No breaks, cracks or repairs. Several scraps and dings as is common. Some areas of paint loss and mineral encrustations as would be expected. Rare for its size and near choice. Approx. 3.25" tall x 2.5" across. 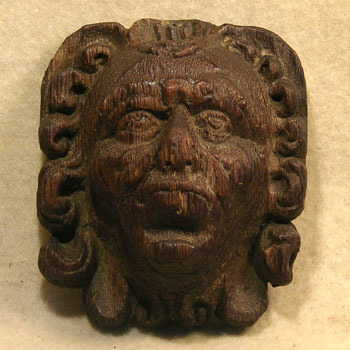 Small oak decorative carving from Europe, most likely from England. Nicely carved face surrounded by scroll-work (hair), executed in high relief. Beautifully detailed face with eyes upturned toward the heavens. Originally used as a church pew decoration, it shows some wear as would be expected, but overall in excellent condition with no breaks or cracks. One tiny chip missing from the lower lip. This pieces was sold to me as Early Medieval 600-800 AD - I have since been told it is much later so I have changed the description and price. This is outside my area of expertise. If any of you experts out there can help positively date this item, your input is welcome. Thank you. Approx. 3" tall x 2.5" wide. Just over 1" thick. 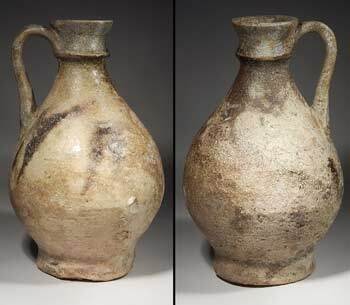 Nice pottery pitcher from the Holy Land, dating to the Roman Period. Lovely form with wide body, loop handle and trefoil spout. Probably used in ancient times to hold oil and fill lamps. Encrusted on the bottom but in excellent condition. No cracks, breaks or repairs. 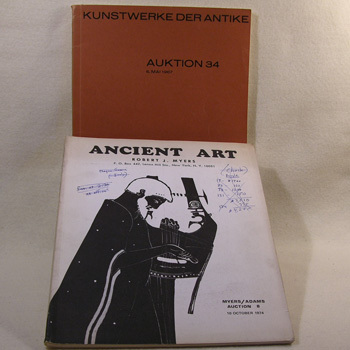 Serious collectors know the importance of good reference material and old auction catalogs are always desirable. Packed with photos, dates and descriptions, they offer a wide range of information as well as pricing estimates. "From the Norbert Schimmel Collection"
Very rare hardback catalog with dustjacket. Minor dustjacket wear and one page has a small ink smear (printing error), else in fine condition.